Astronomers started to investigate portions of the electromagnetic spectrum outside the optical in the 1930s. Advances in radar and rocket technology during World War II gave this new research a big push, and it has continued to grow ever since. Let's look at some representative telescopes for these other regions of the spectrum. Remember that the primary job of all telescopes is to gather light; if possible, it's good to focus the light, too. 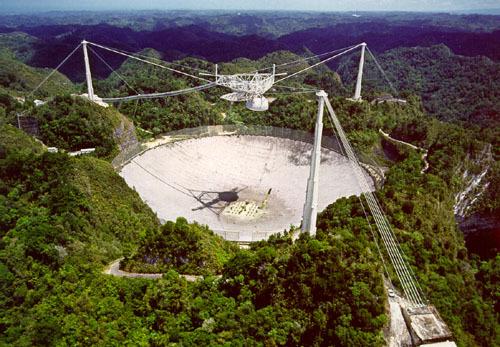 The Arecibo Telescope is the largest radio dish in the world, with a diameter of 305 meters (1000 feet)! 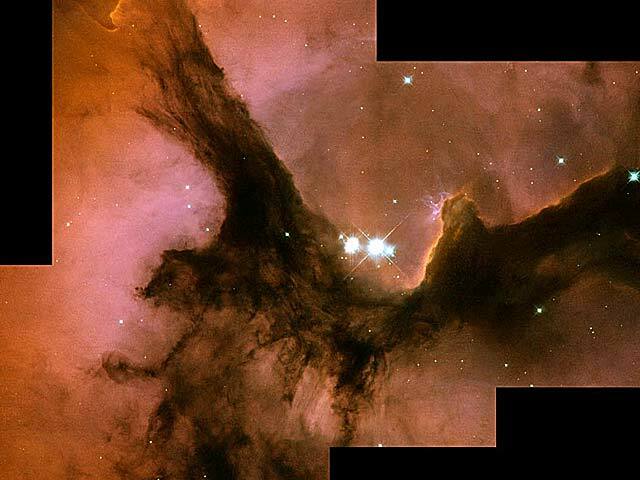 The smaller this fraction, the smaller the details a telescope can distinguish. 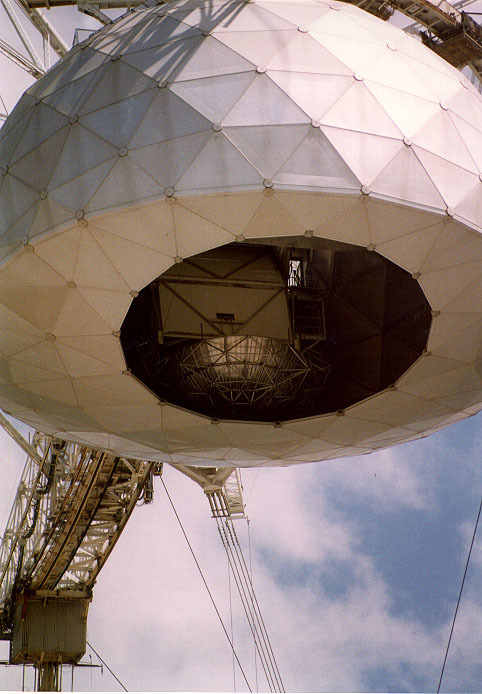 Even though the diameter of the Arecibo telescope is much larger than that of, say, the Keck optical telescope, the wavelength of its light is much, much, MUCH longer. As a result, its resolution is much worse (i.e. the fraction above is much larger), and its pictures are blurry. The Very Large Array of radio telescopes in Soccoro, New Mexico, has 27 antennas of 25 meters diameter each, arranged in patterns up to 22 miles across. courtesy of Dave Finley and National Radio Astronomy Observatory and Associated Universities, Inc. The SOFIA data will be processed here at RIT before being distributed to scientists around the world. X-rays are blocked completely by the Earth's atmosphere (and a good thing, too), so one must place X-ray telescopes in orbit. Another problem with X-rays is that they penetrate ordinary matter. That means that they tend to go through mirrors instead of bouncing off them. The only way to focus X-rays is to design a telescope so that the incoming light always grazes the mirrors at a small angle. 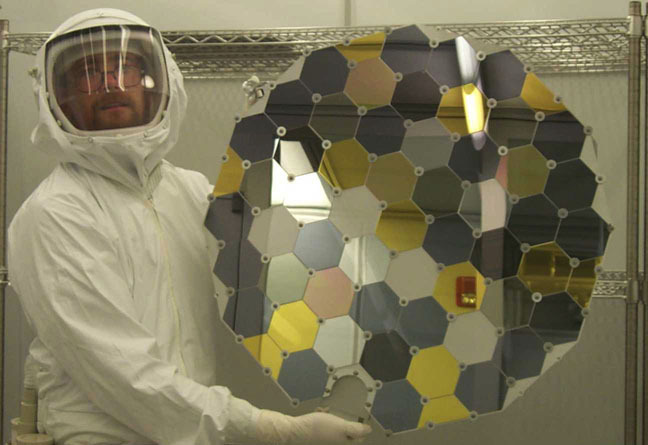 The Chandra mirrors were aligned right here in Rochester, by Kodak. Gamma rays are even more energetic than X-rays, and they, too, are blocked by the Earth's atmosphere. The conventional way to observe them is to place a telescope in orbit ... but it turns out that one can observe them indirectly from the ground, too. 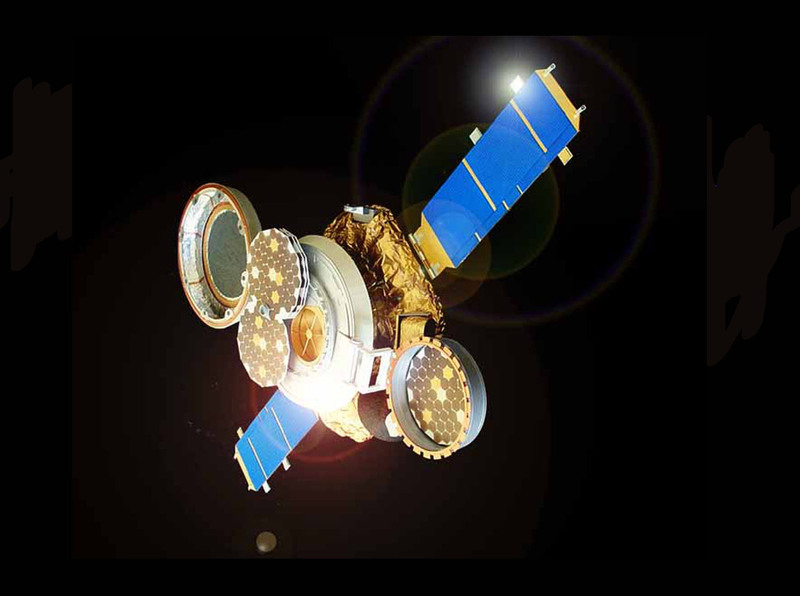 The Compton Gamma Ray Observatory orbited the Earth from April 5, 1991, until June 4, 2002, detecting high-energy photons with several different instruments. 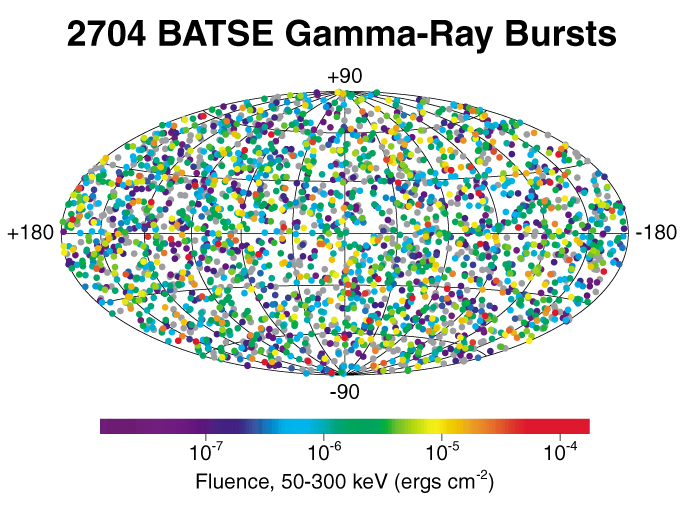 It detected thousands of gamma ray bursts, but was only able to indicate the location of each one to about 5 degrees. The Whipple Gamma Ray Observatory has a 10-meter dish made of multiple mirrors to detect Cerenkov light from gamma-rays striking the Earth's atmosphere. 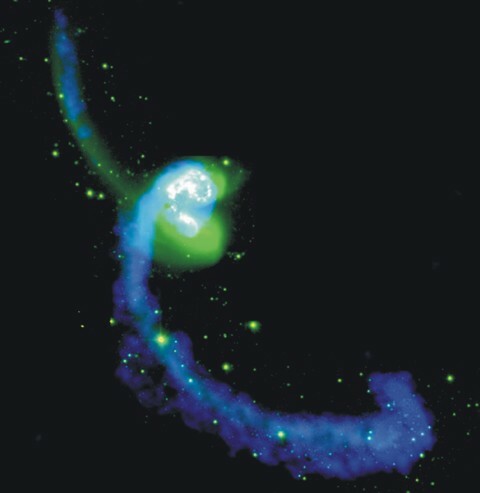 Even though the gamma rays themselves don't make it to the ground, remnants of their violent collisions with air molecules do. 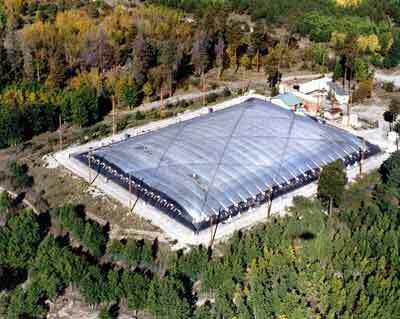 The Milagro Gamma-ray Observatory is a swimming pool lined with phototubes, and covered with an opaque sheet. It detects the particles (not the photons) created by the collision of a gamma ray with the upper atmosphere. Neutrinos are ghostly particles which almost never interact with matter. They can (and do) pass through an entire planet untouched. 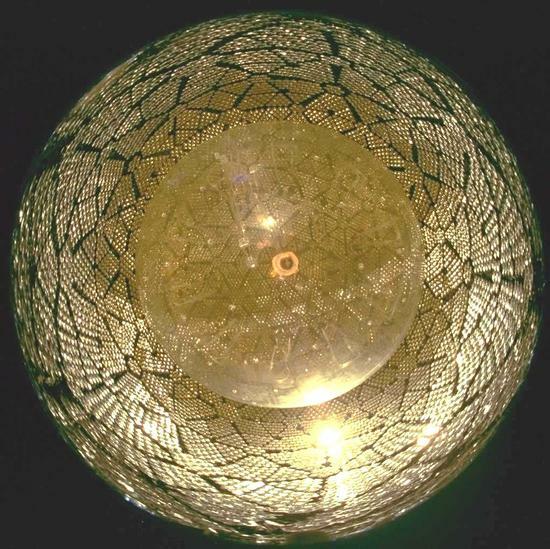 Every second, over ten trillion neutrinos produced in the core of the sun zip through your body! So, how can one detect these neutrinos? One needs to put a big chunk o' matter in their path, monitor the matter very carefully ... and be prepared to wait patiently. 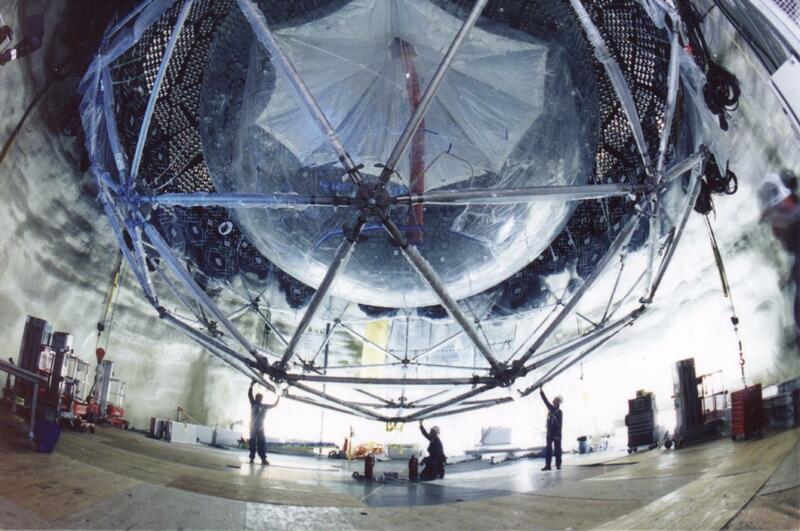 AMANDA is a neutrino telescope which uses the Antarctic ice cap as its "primary detector". A very few neutrinos collide with the nucleus of an atom in the ice, producing a brief flash of Cerenkov radiation. In order to detect those brief flashes, scientists have bored holes more than 1 mile deep in the ice and suspended phototubes in the holes. 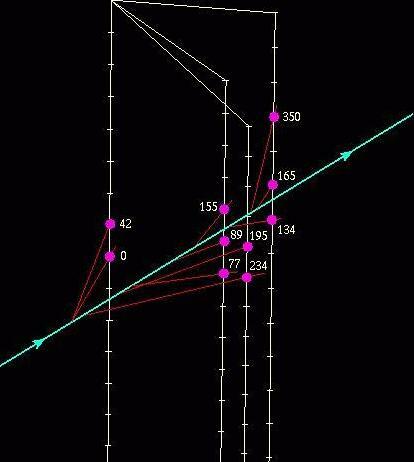 Here's the record of an actual event (muon, not neutrino) recorded by Amanda (click on the figure to watch a short animation). 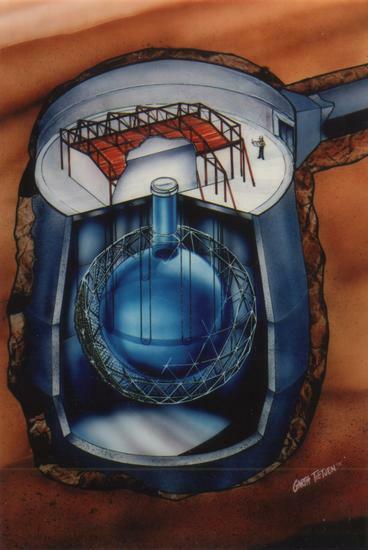 The Sudbury Neutrino Observatory is a big plastic ball filled with very pure heavy water, lined with phototubes, placed in an old mine. Photo courtesy of Ernest Orlando Lawrence Berkeley National Laboratory. to the Sun, and let solar wind particles smash into them and stick. 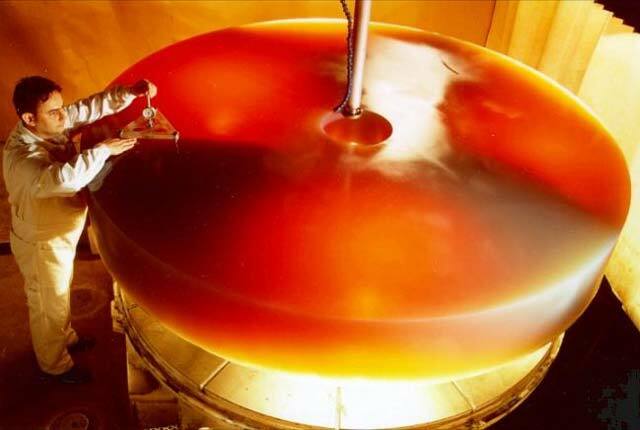 Bill Keel has put together a Web site about The Telescope's He's Used (and what he's done with them). Interested in interferometry? Play with a toy radio interferometer created by Nuria McKay, Derek McKay and Mark Wieringa. Watch the SOFIA aircraft video to see how the telescope will work in flight.